A must-read, firsthand miracle account of first responders and medical professionals working together to save the life of one Canadian man. A fit and high spirited Jim Graham leaves home in West Vancouver, Canada, on a bright June morning for a practice bike ride. He and his buddy, Andy, were preparing for a Ride for Cancer to Seattle. Twenty-six days later he returns home, changed forever. Fifteen feet into the United States, Jim’s heart stops six times in the first valiant rescue efforts. First responders air lift him to St. Joseph Medical Centre ICU in Bellingham. Jim is placed on full life support and given little chance of survival. From deep within a medically-induced coma, Jim fights for his life. An unbroken chain of doctors, border guards, nurses, emergency transporters, social media and his beloved family and friends keep him anchored to life. 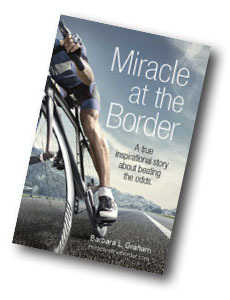 Written in courageously revealing prose by his wife, author Barbara L. Graham, Miracle at the Border takes us on a journey from trauma to triumph, revealing real people and experiences in the complex world of crisis medicine. We glimpse into the hearts and minds of life-saving professionals sharing in their own words their technical reports and personal insights. In a dedicated chapter, this gritty, profoundly human account also generously shares through personal experience and research, practical insights, strategies, and lessons learned, plus a variety of trauma-related resources. A testament to the work of unsung heroes, the power of love and the might of medical technology, this true inspirational story about beating the odds assures us that miracles can and do happen. 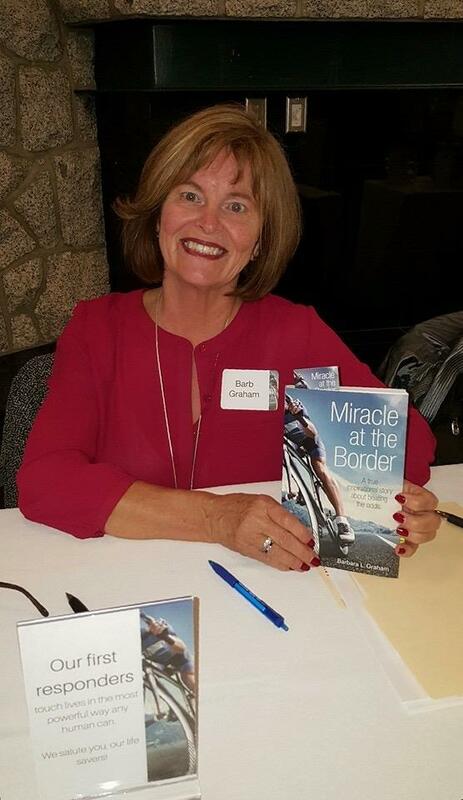 Proud Author at Miracle at the Border Launch! “Had this book just been a medical thriller, it would not have been the page-turner (at least not for me). However, Barbara Graham tells the story in a very open an honest way that explains how the trauma of this event not only impacted her husband but also herself, family, and friends. She also wove in a couple dozen short commentaries from people directly involved – from the border guard who first administered CPR, to the surgeons who had to make quick life and death decisions in the critical first week to an assistant who rode in the transport ambulance and several others. Also, the book includes words that were written by her and her two daughters, on the Caringbridge.com web site, as the events were unfolding. Thus, the book brings in multiple view points during this intense journey and pulls you quickly through chapter after chapter. The word “heartwarming” takes on new meaning in Miracle at the Border, Barbara Graham’s account of her husband Jim’s cardiac arrest June 7, 2015, and the truly miraculous sequence of events that followed. The story is incredible, from the actions of the first responder who saw Jim fall off his bicycle and started CPR within seconds, to the day Jim was released from St. Joseph Medical Center in Bellingham, on his way to a complete recovery. But the sub-stories are also incredible. Jim’s grave condition and the impact on his loving family and friends was first revealed through blogs on the website Caringbridge, where Barbara, the Graham’s daughters Jane and Kris, and others chronicled Jim’s journey as he underwent the drastic medical procedures that ultimately saved his life. Love in its many forms is palpable throughout the book, and Jim’s ability to beat near impossible odds attests to the power of the love that surrounded him.